Approaching the Louwitor, day 1. This 6-day ski tour in the Swiss Berner Oberland wanders among the Jungfrau, Mönch, Eiger, and other famous peaks at the source of the giant Aletschgletscher. We will travel between four high mountain huts, and have opportunities to make ski ascents (and descents!) of several summits. The setting here is spectacular  with tremendous vertical relief and giant valley glaciers more akin to Alaska than to these lower latitudes. Advanced to expert skiers in very good physical condition are best equipped to fully enjoy this tremendous terrain. Previous mountaineering experience is helpful but not required. This is a fantastic place! It is little known in North America but is a real gem. It is a great alternative to the Haute Route for those seeking a bit more solitude and more options for varied ski ascents and descents. While the Haute Route has a strong sense of a journey from one point to another, the Berner tour is one of discovery and great ski descents. The skiing, in an incredible setting, is what this area is all about. In this 6-day itinerary, we are able to visit the most impressive parts of the range. Starting in the north at the Jungfraujoch we move south, then west to the area of the Hollandia hut. From here, we go east over the Grünhornlücke pass to the Finsteraarhorn hut. To exit the mountains we continue east and south, finally descending into the headwaters of the Rhone Valley, having traversed nearly all of the massif. The descent of the Wyssnollen. This tour requires a good level of fitness and excellent skiing abilities. Some of the days are long and skiers need to have enough energy to go all day long. Skiing skills need to be at an advanced to expert level. The reason for this has more to do with the conservation and expenditure of energy over a long day than the absolute technical difficulty of the skiing. Some of the skiing can be quite steep, particularly the descent from the Hugisattel or the upper part of the Wannenhorn, but for the most part the slopes are not overly steep. The challenge comes in managing poor snow conditions (heavy wet snow, crud or breakable crust) and not losing too much energy in the process. Great skiers look like they are hardly working, and this is in fact the case. If your skiing is not up to par you will spend far, far more energy than a better skier. Ability to execute hop parallel turns or pedal-hop turns on 35° firm snow. Ability to side-slip, both forward and backward, on firm 40° slopes. Skiers who regularly enjoy black or double black runs in most western American ski areas should do fine. If you like to get off the piste and into the crud, ski the trees, and in general look for the steeper shots, you'll probably have a great time on this tour. If you tend to stick to the groomed slopes and find the wild untracked a bit intimidating you should think twice about this option. We will likely encounter all different kinds of snow, from the best to the worst, and you need to have sound energy efficient strategies to cope with them. A good gauge of you ability is found in mogul skiing. If you are good in the bumps and seek them out, then you most likely have developed the rhythm and balance needed for steep or difficult snow. You must be able to ski fairly steep bumps in good conditions, skiing rhythmically and fluidly, following a line near the fall line with good speed control. If you have any doubt about your ability to manage the skiing on this classic route, please join us in the Alps for a shake-down training session. You need to be able to do quick and easy kick turns, facing into the mountain. We will review these skills en route. 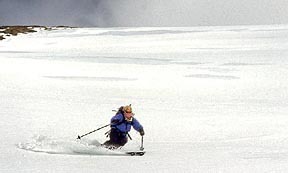 Skiing up to the Lötschenlücke. Train to Jungfraujoch. A short ski descent of the upper Jungfraufirn, then up over the Louwitor. A descent of the Kranzbergfirn, then up to the Hollandia hut for the night. From the Hollandia hut we make a ski ascent of the Äbeni Flue before heading to the Konkordia Hut. Cross the Grünhornlücke pass and descend to the Fieschergletscher. Make a side trip up and down the Wyssnollen before continuing on to the Finsteraarhorn hut. 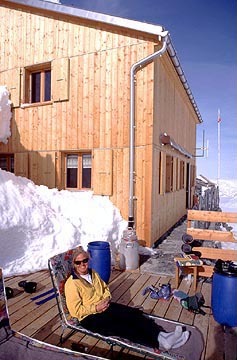 Ski ascents based out of the Finsteraarhorn hut. Options include an ascent of the "Chamonixspitze", a fine summit and viewpoint just north of the Finsteraarhorn; the Hinter Fiescherhorn; a ski tour up to the Hugisattel, high on the Finsteraarhorn; or other possibilities. Back to the Finsteraarhorn hut for the night. We start the day with an ascent of the Gross Wannenhorn, arguably the finest ski ascent in the Berner, before continuing on to the Oberaarjoch hut. From the Oberaarjoch hut there are a number of options for great descents back into civilization. Our favorites are over the Vorder Galmihorn and down the Bächigletscher to Reckingen, or over the Galmilicke and down to Münster. We take the train back to Interlaken at the end of the day.